Copies of cited foreign patent documents and non-patent literature references (except as noted below) are automatically furnished without charge to applicant together with the Office action in which they are cited. Copies of the cited references are also placed in the application file for use by the examiner during the prosecution. Copies of U.S. patents and U.S. patent application publications are not provided in paper to applicants and are not placed in the application file. Copies of references cited by applicant in accordance with MPEP §§ 609, 707.05(b) and 708.02 are not furnished to applicant with the Office action. Additionally, copies of references cited in continuation applications if they had been previously cited in the parent application are not furnished. The examiner should check the left hand column of form PTO-892 if a copy of the reference is not to be furnished to the applicant. Copies of foreign patent documents and nonpatent literature (NPL) which are cited by the examiner at the time of allowance will be furnished to applicant with the Office action and be retained in the image file wrapper. This will apply to all allowance actions, including first action allowances and Ex Parte Quayle actions. In the rare instance where no art is cited in a continuing application, all the references cited during the prosecution of the parent application will be listed at allowance for printing in the patent. (B) Include in the eRed Folder all of the references cited by the examiner which are to be furnished to the applicant. (C) After any necessary review has taken place, forward the action to the TC mailbox for counting. Any application which is handed in without all of the required references will be returned to the examiner. The missing reference(s) should be obtained and the file returned to the technical support staff as quickly as possible. In the case of design applications, procedures are the same as set forth in MPEP §§ 707.05(a) - 707.05(g). In June 2004, the USPTO ceased mailing paper copies of cited U.S. patents and U.S. patent application publications with all Office actions. See "USPTO to Provide Electronic Access to Cited U.S. Patent References with Office Actions and Cease Supplying Paper Copies," 1282 OG 109 (May 18, 2004). Foreign patent documents and non-patent literature will continue to be provided to the applicant on paper. All U.S. patents and U.S. patent application publications are available free of charge from the USPTO website (www.uspto.gov/patft/index.html), for a fee from the Office of Public Records (http://ebiz1.uspto.gov/oems25p/index.html), and from commercial sources. Copies are also available at the Patent and Trademark Resource Centers (PTRCs). A list of the PTRCs may be found on the USPTO website (www.uspto.gov/products/library/ptdl/locations/index.jsp). Additionally, a simple new feature in the Office’s Private Patent Application Information Retrieval system (PAIR), E-Patent Reference, is available for downloading and printing of U.S. patents and U.S. patent application publications cited in U.S. Office Actions. Access to Private PAIR is required to utilize E-Patent Reference. If you do not already have access to Private PAIR, the Office urges practitioners and applicants not represented by a practitioner to: (1) obtain a no-cost USPTO Public Key Infrastructure (PKI) digital certificate; (2) obtain a USPTO customer number; (3) associate all of their pending and new application filings with their customer number; (4) install free software (supplied by the Office) required to access Private PAIR and the E-Patent Reference; and (5) make appropriate arrangements for Internet access. Step 1: Full instructions for obtaining a PKI digital certificate are available at the Office’s Electronic Business Center (EBC) web page (www.uspto.gov/ebc/downloads.html). Note that a notarized signature will be required to obtain a digital certificate. 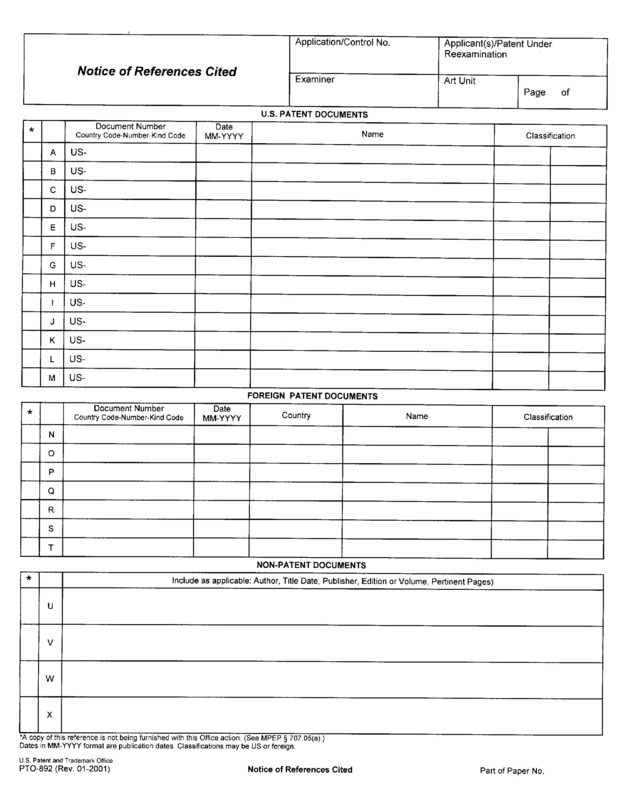 Step 2: To get a Customer Number, download and complete the Customer Number Request form, PTO/SB/125, from the USPTO website (www.uspto.gov/web/forms/sb0125.pdf). The completed form can be transmitted by facsimile to the Patent Electronic Business Center at (571) 273-0177, or mailed to the address on the form. If you are a registered attorney or agent, your registration number must be associated with your customer number. This association is accomplished by adding your registration number to the Customer Number Request form. Step 3: A description of associating a customer number with the correspondence address of an application is described at the EBC Web page (www.uspto.gov/ebc/registration_pair.html). Step 4: The software for electronic filing is available for downloading at www.uspto.gov/ebc. Users can also contact the EFS Help Desk at (571) 272-4100 and request a copy of the software on compact disc. Users will also need Adobe Acrobat Reader, which is available through a link from the USPTO website. Step 5: Internet access will be required which applicants may obtain through a supplier of their own choice. As images of large documents must be downloaded, high-speed Internet access is recommended. The E-Patent Reference feature is accessed using a button on the Private PAIR screen. Ordinarily all of the cited U.S. patent and U.S. patent application publication references will be available over the Internet using the Office’s new E-Patent Reference feature. The size of the references to be downloaded will be displayed by E-Patent Reference so the download time can be estimated. Applicants and registered practitioners can select to download all of the references or any combination of cited references. Selected references will be downloaded as complete documents in Portable Document Format (PDF). The downloaded documents can be viewed and printed using commercially available software, such as ADOBE® READER®. ADOBE® READER® is available free of charge from Adobe Systems Incorporated (www.adobe.com/products/acrobat/readermain.html). This form paragraph is recommended for use in Office actions citing U.S. patents or U.S. patent application publications when the applicant is not represented by a registered patent attorney or a registered patent agent.